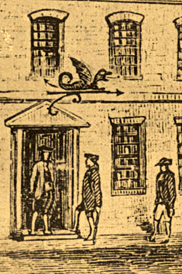 "Where we met to Plan the Consignment of a few Shiploads of Tea, Dec 16, 1773"
In the upper left hand corner of his drawing he put a square and compass. To this day no one knows who planned the Boston Tea Party. John Johnston (c. 1753-1818) watercolor sketch, n.d. Original at American Antiquarian Society, 185 Salisbury St, Worcester, MA 01609-1634. The "vile Bohea" is another name for the tea of the East India Company. It has been rotting in their warehouses in England. This is cheap tea and the Company needs to get rid of it. The British Parliament has given the East India Tea Company a monopoly on tea. The Colonies are not supposed to buy any other tea. Parliament has kept a tax on tea just to prove that they have the power to tax. And taxation without representation, along with a tea monopoly, is tyranny! In New York, Philadelphia and Charleston, the Consignees for the tea had resigned their Commissions at the request of the Sons of Liberty. Those tea ships had sailed back to England with the tea. There were no Consignees to pay the tax and sign for the tea. But not in Boston! Governor Hutchinson and his family were in the tea business. Two of Governor Hutchinson's sons and a son-in-law were Consignees. The Tea Act stated that if the tea was not sold by December 17th, it could be seized by the custom house and sold for nonpayment of duties. Once the tea was in the Governor's hands, he could dispose of it secretly to local merchants. No. The Consignees would not resign. Steps had to be taken before December 17th. The whole Tea Party was in range of a 60-gun warship. The British Admiral watched from the upstairs window of a house nearby. Afterward the "Mohawks" marched by under his window. The Admiral opened the window and shouted, "Tomorrow you'll have to pay the piper!" Faneuil Hall and the Old South Meeting House still stand in Boston. The Green Dragon Tavern burned down years ago. The heritage lives on in a picture made in 1773. The artist had the fortitude to sign his name to the words: "Where we met to Plan the Consignment of a few Shiploads of Tea. Dec 16, 1773."